Did you see the precursor? The "She's still coughing up hairballs, you sick, furry, f*&%!" part? Yep! I'm constantly struck by how different Harrison Ford's personality is from the characters he portrays. These facial tattoos are a perfect example of why I'm excited for the movie. It's a little visual detail that was not explicitly stated in the book, but rather something that the film adaptation has a chance to add to the EG universe. I can't wait to see what other stylistic choices the people behind this movie decide to make. "At present, the law prescribes two (2) as the maximum number of children"
I think they mean "proscribes"
"These exclusive academies provide a safe place for gifted children to refine their focus and learn the necessary skills to lead our planet in the impending intergalactic war. Prepare our world for the future and prepare your child for greatness today." Shouldn't that be intragalactic or simply galactic? The Formic worlds are in the Milky Way and besides even at relativistic speeds, the vast distances of intergalactic travel would take too long. 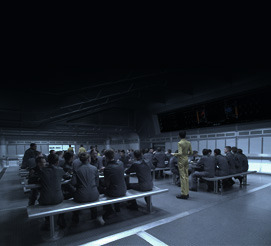 Also, that's a new screenshot of the mess hall with the scoreboard intentionally (and rather obviously in the full size image) blacked out. "Interstellar" would be my adjective of choice, but I mostly plug my ears and go "la la la, not listening" whenever the phrase "galactic" or "galaxy" shows up in marketing (or even in some lighter sci-fi fare), because the chances are good it will be wrong. Firefly was particularly egregious in appearing to use "solar system" and "galaxy" interchangeably. New clip of Graff welcoming launchies. I just went and played the game. I must have been one of the first 40, since I am also in Dragon Army. If you go here and play the Game (it IS a Game, you know), and look at the moving background image of the far-side of the Battle Room (the Enemy's Gate, if you would), you will notice a series of cars running clockwise just within the bright, white ring. 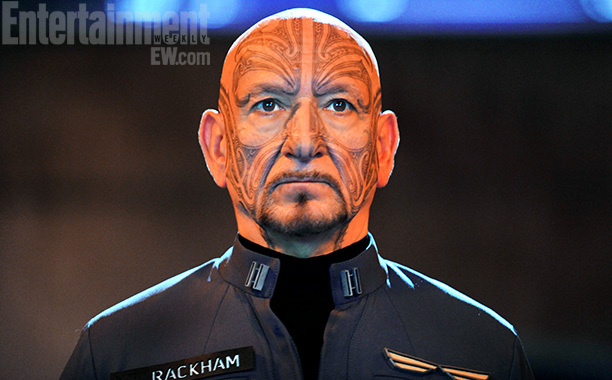 In other words: I think the Ender's Game movie is using my design. Boothby wrote: I just went and played the game. EAGLE wrote: lol would that be an insult or a compliment? Actually, it would be both. With a month left to go, when can we expect marketing to swing into full gear with TV ads and whatnot? How long before opening does it usually start for movies? I'm just getting sick of seeing Ronnie's race car movie every commercial break on every channel and am wondering when it will be EG's turn. Notice how most of the ads along the bottom scroll are for HUNGER GAMES! BTW, I have heard rumors that there are now TV ads for EG, but I haven't seen any of them. It may just be the luck of the draw, but I haven't seen any EG trailers in the movies, lately, either. Though they STILL have the moving display at my local theater.....hmmm! yes there are tv ads for EG the movie, sci-fi (I believe) is running some. when I went to IMDB to look up something (as I tend to do), EG was TOP billing on the banner. I got that today in an e-mail from a local IMAX theater. Ender's Game comes out a full TWO WEEKS before Hunger Games. Hunger Games has a guaranteed audience. Why haven't I received a similar ad for Ender's Game? Because I haven't. ya it's because there is already a hype for that sequel. The first movie became so big seemingly out of no where. At least it was for me. I never heard of the book, the series, nor anything about it till the movie previous, and thus movie it's self. Though more to your point is that pandora is currently running ads with the whistle from the mocking-jays from the first hunger games, it's creepy but I instantly remember the first movie when I hear the sound. If there was a way to get pandora to have, idk, "the enemy's gate is down" or something similar for a catchy promo then maybe we would have more hype for the movie. I was watching the Today Show this morning and I saw the commercial . My Father landed in London the other day, he tells me that he's seen a couple of them here and there. I'm getting really excited now. I also saw the first EG trailer on tv yesterday. One month left! enderwiggin.net debut a clip from the movie, Ender's Army. The scene is pretty close to the book, if you ask me. Big Ender's Game billboard (because there are no SMALL billboards) on the Major Deegan Expressway, in da Bronx, NY!!!! This, I did not expect: The "Photo Booth" at the mall had Ender's Game themes, and you got to watch an Ender's Game commercial in the booth while you figured out the instructions!! NOT "Hunger Games." "Ender's Game"!!! Last edited by Boothby on Wed Oct 16, 2013 9:59 am, edited 1 time in total. Definitely lots of commercials now, I did notice it as well during the Walking Dead this weekend (as someone mentioned). My family was up in Times Square this past friday night, and they said they saw ads for it as well. Its getting soooo close. huh, that's a pretty funny form of publicity. Glad they're finally on top of it! I do find it *somewhat* promising that "even" Ben Kingsley and Harrison Ford are so upbeat and rave so much about the quality of the film. Yes, Of COURSE they "should," but I think / hope that they wouldn't be complete sell-outs if they didn't believe it.